New work from Carnegie EFree scientists Russell Hemley and Ivan Naumov hones in on the physics underlying the recently discovered fact that some metals stop being metallic under pressure. Metals are compounds that are capable of conducting the flow of electrons that make up an electric current. Other materials, called insulators, are not capable of conducting an electric current. At low temperatures, all materials can be classified as either insulators or metals. Insulators can be pushed across the divide from insulator to metal by tuning their surrounding conditions, particularly by placing them under pressure. It was long believed that once such a material was converted into a metal under pressure, it would stay that way forever as the pressure was increased. This idea goes back to the birth of quantum mechanics in the early decades of the last century. But it was recently discovered that certain groups of metals become insulating under pressure – a remarkable finding that was not previously thought possible. For example, lithium goes from being a metallic conductor to a somewhat resistant semiconductor under around 790,000 times normal atmospheric pressure (80 GPa) and then becomes fully metallic again under around 1.2 million times normal atmospheric pressure (120 GPa). Sodium enters an insulating state at pressures of around 1.8 million times normal atmospheric pressure (180 GPa). Calcium and nickel are predicted to have similar insulating states before reverting to being metallic. Hemley and Naumov wanted to determine the unifying physics framework underlying these unexpected metal-to-insulator-to-metal transitions. 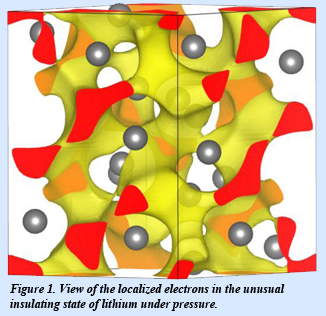 The principles they developed will allow for predictions of when metals will become insulators under pressure, as well as the reverse, the the insulator-metal transition. The onsets of these transitions can be determined by the positions of electrons within the basic structure of the material. Insulators typically become metallic by a reduction in the spacing between atoms. They demonstrated that for a metal to become an insulator, these reduced-spacing overlaps must be organized in a specific kind of asymmetry that was not previously recognized. Under these conditions, electrons localize between the atoms and do not freely flow as they do in the metallic form. This is yet another example of how extreme pressure is an important tool for advancing the understanding of the nature of materials at a fundamental level. 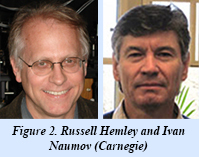 The work will have implications for the search for new energy materials [I. Naumov and R. Hemley, Phys. Rev. Lett. 114, 156403 (2015)].